An exotic and resonant scent for women that radiates casual sophistication for any time of the day, Eau Des Merveilles perfume by Hermes is an evocative and spicy choice that will turn heads wherever you go. 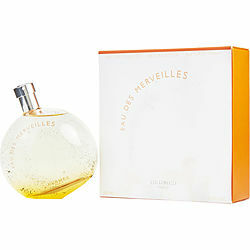 Introduced by Hermes in 2004, Eau Des Merveilles brings together a rich and thoughtful balance of vetiver, pepper, fragrant woods and citrus for an appealing construction. Just add a touch to your pulse points; it's great for a broad variety of casual occasions.